Try your hand at a technique used by nearly every player who’s ever played a solo, with our easy legato lesson. We’ve looked at both hammer-ons and pull-offs before in this series. If you can remember those then you’re halfway to mastering legato as it’s a mixture of the two. Hammer-ons and pull-offs are easy guitar techniques, often associated with soloing, but they can be used in rhythm playing too. The idea is that instead of picking the string on every note you play, you can use your fretting hand to sound certain notes. 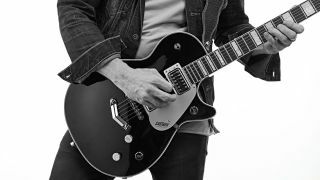 Generally, you’ll get a smoother, more fluid sound - and legato can help you build your soloing speed too. Take a look at the Hammer and Pull section below. Yes. Hammer-ons and pull-offs are used by all players in any genre you can think of, from rock and metal to folk, jazz or classical - these techniques are used everywhere. Jimi Hendrix and modern blues-rock great John Mayer both use them extensively for both rhythm and lead. For guitarists, legato means using a mixture of the two techniques to create smooth-sounding, often winding melodies. Basically, it’s a shortcut to widdly soloing without the challenge of picking every note. Joe Satriani and Steve Vai are virtuosos at it, as are Allan Holdsworth, Brett Garsed and Eddie Van Halen. Don’t worry! Take a look at the first tab example. Just alternate between the 5th and 8th frets on the first string. Give your finger a flick to the side as you play the pull-off . You’ll be picking the string with your fretting finger instead of using a pick. Focus on the first five notes of the tab. Practise and repeat this short phrase. It’s quite a fast run of notes so you’ll need to use three fingers. Fret a note with your first finger, pick the string, then, as the note rings out, ‘hammer on’ to a higher note without plucking the string again. Fret a note with your third finger, pick the string, then, as the note rings out, ‘pull off’ to a lower note without plucking the string again. Obviously, the 5th and 8th frets are the main notes. Depending on which is the most comfy, use your first and either your third or fourth fingers. Use either your first, second and third or first, third and fourth fingers. The ‘staple’ marks tell you which notes to pick, but you can pick when you like.